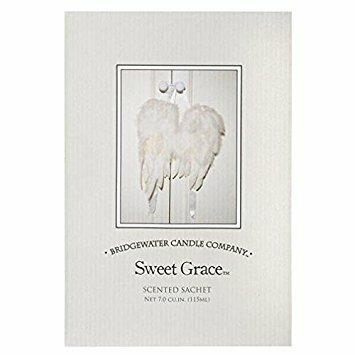 Bridgewater Candle decorative sachets are printed on recycled paper and are biodegradable, making them perfect for cars, closets, gift baskets, vacuum cleaners, simmering pots or just about anywhere. Approximate size 7 Cubic Inches. Includes 6 sachets. Sweet Grace has passionate fruits with sparkling tea and classic patchouli. Includes 6 Sachets. If you have any questions about this product by Bridgewater Candle, contact us by completing and submitting the form below. If you are looking for a specif part number, please include it with your message.